Mtn Dew Kickstart is finally returning to its roots and bringing you a flavor that simply nobody else can match. This NEW line of Mtn Dew Kickstart offers the bold taste of our original Mtn Dew flavor that you know and love, now with an extra boost of caffeine so that you’re ready to tackle what’s next. Try Kickstart Orange Citrus from Mountain Dew! Combining the refreshing taste of Dew with real fruit juice, Vitamins C & B and plenty of caffeine to get you going. A great alternative to the traditional morning beverages. Begin your night with Mtn Dew Kickstart Black Cherry! Just like the Kickstart Fruit Punch and Orange Citrus, this new flavor combines the great taste of Dew with real fruit juice, Vitamins C & B and enough caffeine to crank it up for the evening not just morning. Kickstart Fruit Punch from Mountain Dew combines the refreshing taste of Dew with real fruit juice, Vitamins C & B and enough caffeine to crank it up without overdoing it. Kickstart is a new way to do mornings, with more caffeine than regular Dew but less than coffee. A juicy Mtn Dew Kickstart Midnight Grape is now available with the great taste of Dew, real fruit and electrolytes for taste, to get you ready for whatever comes your way. New … Mtn Dew Kickstart Mango Lime! The great taste of DEW with real fruit and electrolytes for taste. Mtn Dew Kickstart Recharge Blueberry Pomegranate combines the great taste of Dew with real fruit juice and antioxidants vitamins C and E to get you going. 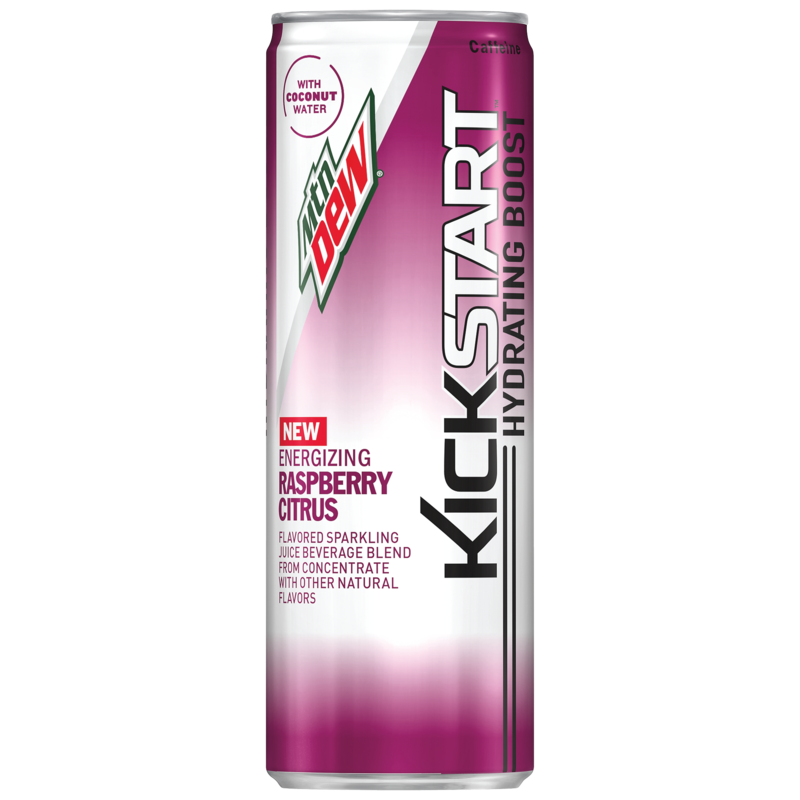 Try the new Mtn Dew Kickstart Raspberry Citrus! Combining the great taste of DEW with real fruit juice and coconut water to get you charged for your next big moment. Mtn Dew Kickstart Recharge Blood Orange combines the great taste of DEW with real fruit juice and antioxidants vitamins C and E to get you charged for your next big moment.